If Deep Space Industries has its way, there’ll be a small robotic lander on a nearby asteroid in just three years. That’s the latest phase of the California-based asteroid mining company’s plan to bring about an outer space real estate boom by creating a resource supply chain off Earth. Asteroid mining is still in its infancy—no would-be miners have managed to land on a space rock, much less harvest the water and metals locked away inside of it. But if a spate of recent announcements are any indicator, Deep Space Industries is hoping to lead the charge. Earlier this year, the company unveiled Prospector X, a tiny robotic spacecraft that’ll sit in low Earth orbit testing technologies for future asteroid prospecting missions, including water-powered propulsion and optical navigation systems. That spacecraft is on track to launch in late 2017. 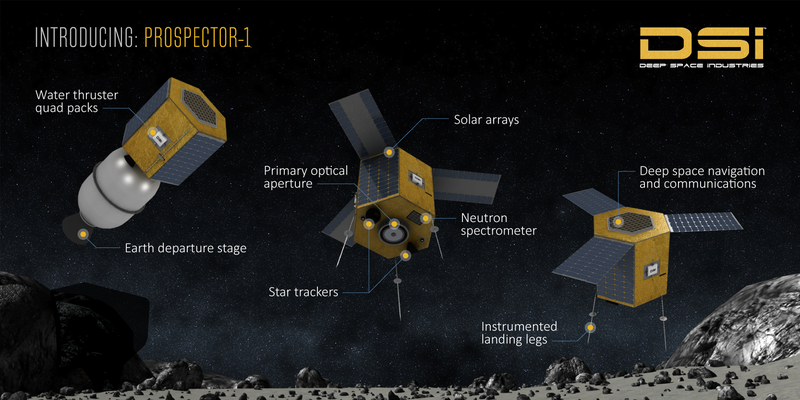 Shortly thereafter, the company intends to ship off the very first asteroid-bound Prospector 1. This vehicle—just 50 kilograms when fueled up—will hitch a ride into low Earth orbit before pointing itself at a target, firing up the water-powered thrusters, and setting sail for riches and glory. Landing on an asteroid also allows Deep Space Industries to lay claim to its resources—sort of. While no company, government or individual can own a celestial body under the 1967 Outer Space Treaty, in principle, companies shouldn’t interfere with each others’ space-based activities, Faber said. We’ll see how that plays out. There could be a several year gap between the arrival of the first Prospector 1s and the first actual mining gear— a harvesting spacecraft that will tug the asteroid to a processing facility. If a competitor meanwhile decides it wants to harvest the exact same rock, things could get very interesting. One new piece of legislation that clearly works in Deep Space Industries’ favor is the US Commercial Space Launch Competitiveness Act, which grants companies legal ownership over any resources they’re able to mine in space. In other words, if you harvest it, it’s yours. The ideal space rock will be rich in water, which can be used to make rocket fuel, volatiles like CO2 and methane, and useful metals. As Deep Space Industries told me several months back, the point is not to sell these resources back on Earth, but to create a space-based supply chain so that others can start building in and beyond orbit at a lower price point. It currently costs thousands of dollars to send a kilo of material into space, vastly restricting what can be done up there.